When traveling in an RV, you still need to have the modern conveniences of life. Appliances like a coffee machine, TV, and microwave are all essential components of RVing, which means that you need reliable access to power whenever you’re parked for the night. Unfortunately, unlike the power that goes into your home, you can’t always find reliable sources of energy. This means that you might plug into an outlet that has faulty or improper wiring. When you’re plugged into an inferior electric source, it could spell disaster for your various appliances and electronics, not to mention the batteries of your RV itself. If there are any surges or spikes, it could cause untold damage to your stuff, and no one wants that. Fortunately, RV surge protectors are here to help. These devices enable you to plug into any outlet without the constant worry that your electronics could get fried in the process. Today we’re going to be looking at the best RV surge protectors and how they can help you. As I mentioned, Progressive Industries is one of the most widely used and well-respected brands making surge protectors. In this case, you’re getting a higher quality unit that does some electrical management along with surge protection. When comparing the rating for different models, you’ll see that this particular unit is much higher than the competition. As I said above, these ratings shouldn’t be the only thing you look at, but when taken at face value, you can see that this is one of the better surge protectors out there. 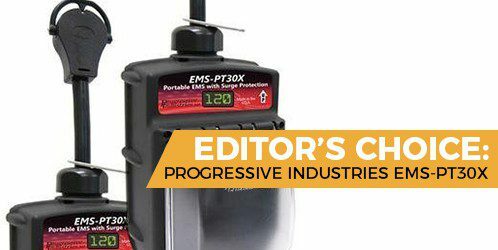 One reason that Progressive Industries is one of the top companies in the industry is that all of their devices are built for extreme weather conditions. Since you could be RVing in the rain, snow, or sweltering heat, it’s nice to know that your surge protector can handle it all. In addition to the standard all-weather housing, this particular model has a hinged plastic protector that helps keep your plug dry in the rain. Not only that, but you can lock the protector in place so that no one can steal it. With most surge protectors, you get a set of LED lights to tell you what’s wrong. With this model, however, it has a readable screen that says what’s going on. Since it can detect various issues like open ground or reverse polarity, this screen is much more reliable. Compared to other “plug and play” surge protectors, this model is one of my favorites. Not only does it have the same rugged design as all Progressive Industries units, but it’s much easier to use. I also like that these protectors come with a pull handle to remove it from the outlet. There are times when you can struggle to unplug, so it’s nice that this unit makes it so much easier. Overall, the only issue that I see with this protector is that it’s not as high-quality as a fully-integrated EMS model. However, as far as portable surge protectors go, this is almost the standard for the industry. When picking out the right RV surge protector, there are a handful of different features you should pay attention to at the beginning of your search. First, you need to look at the amp rating. This will tell you whether the surge protector is sufficient for your needs. They come in either 30 or 50-amp settings. Second, you want to get either a portable model (like this one) or something that installs into your RV’s electrical system permanently. We’ll go over the differences later on, but the primary element is that portable protectors are much easier to use. Progressive Industries is one of the best options out there, making this a reliable piece of hardware for your RV. While this specific protector isn’t the best that the company makes, it’s an excellent choice when you want something simple and rugged. One thing about portable RV surge protectors is that they’re going to be sitting outside all day and night. Thus, you need to make sure that it’s prepared to handle the elements. In this case, the SSP30X is designed to withstand temperatures of -40 degrees C to 105 degrees C. No matter where you’re traveling, you don’t have to worry about this protector failing because of the weather. With some surge protectors, they are only made to protect your RV from spikes in electrical output. That means that if you plug into an outlet with faulty wiring, you won’t know until it damages your appliances. With this model, however, it can warn you about a variety of electrical problems. These issues include open ground terminals, open neutral and reverse polarity detection, surge failure indicator, and missed wires. Best of all, this device will warn you immediately via alarms and LED lights, meaning that you don’t have to wait until something bad happens to figure out if the surge protector will work. Although some surge protectors out there have complicated warning systems, this one is simple and easy to read. While only three lights don’t provide too many options for different electrical problems, all you really need to know is whether it’s safe to plug your RV in or not. This surge protector is really easy to use, and it’s perfect for casual RVers who want to add some safety to their rig whenever they plug in. While it’s not the most high-tech option out there, it gets the job done and can give you peace of mind. Plus, I like that it’s built to withstand the elements. As with all RV surge protectors, you don’t get a full suite of protection for your rig. For that, you’ll need an electrical management system (EMS). Thus, no matter how good these appliances are, they have limited potential. Nonetheless, if you don’t decide to go the EMS route, this is a decent choice. As the name of this model suggests, this is an excellent entry level surge protector. As with most models out there, it’s a 30-amp unit, meaning that it’s perfect for most RVs (all but the largest and most luxurious). This cord is longer than other ones, which can help give you just enough room to plug in from a distance. Also, the longer wiring ensures that it can manage heat spikes better since there’s more surface area to dissipate it. One other element of RV surge protectors is the joules rating. The higher the number, the better it will be at protecting against spikes. One thing to note, however, is that the joules rating is only for surges, not for other electrical problems. Thus, don’t just compare different protectors by looking at this number. These are relatively complicated devices that have a multifaceted design. Each component is crucial, so you have to look at all of them simultaneously. For the most part, you never want to get a surge protector that only does one thing. While those models are always cheaper, there’s a reason for that - you don’t get as much security for your rig. In this case, the 44260 can detect the most common electrical issues, including open ground connections and reverse polarity. Again, this is an entry-level model, so keep in mind that it won’t detect more complex problems with your electrical pedestal. As with most RV surge protectors, this unit comes with an LED warning system. There is a handy guide on the front as well to tell you what each light means so that there is no confusion. Overall, this is a super simple setup. If you’re just looking for some added peace of mind and a relatively cost-effective product, then this is a decent option. It holds up well in the weather, and it can detect the most common electrical issues. If you’re a full-time RVer, you should probably invest in something a bit more comprehensive. While this unit is okay for parking overnight, it probably won’t suffice for extended stays, particularly if you’re parking at places with unreliable power (i.e., a campsite). Although Progressive Industries is one of the top brands in RV surge protection, that doesn’t mean that the company has no competition. When it comes to high-quality surge protection and electricity management, this unit from Camco gives any PI unit a run for its money. When looking at how well this surge protector keeps your RV safe from spikes, you can tell that it’s much higher quality than other models based on this rating. Thankfully, it also comes with a host of other features that make this number even more significant. Compared to other plug and play surge protectors, this unit is going to keep your RV well protected in a variety of situations. One thing that many other surge protectors don’t do is shut the power off when there are problems. Instead, they act as “electricity sinks.” That means that they absorb the extra power so that it won’t go into your RV. However, there’s no guarantee that the energy won’t still make it through, which is why most surge protectors are not as good as EMS models. Fortunately, that’s not the case with this unit. If there is a spike or other electrical issue, this protector will automatically shut down and cut the power (like a circuit breaker). This feature not only saves your appliances but reduces the wear and tear on the device itself. Best of all, once the power returns to normal, the protector will turn back on and resume working. As with all of the other devices on this list, the Power Defender can detect all kinds of issues, ranging from open ground connections to reversed polarity. Simply put, you can feel confident that your rig will be in good hands when plugging into this system. I’ve been lightly touching on the subject that EMS units are generally superior to standard surge protectors (and more expensive). The reason for that is because they can adjust the power running into your RV, rather than absorbing excess spikes. With this unit, however, you can rest more easily because of the automatic shutoff function. Not only do you not have to worry about electricity surges making it through, but this design will keep the device in better condition as well. In some cases, the automatic shutoff switch may be a little hypersensitive, meaning that you could lose power when the energy levels don’t fluctuate that much. Nonetheless, it’s a simple replacement, and you should be up and running in no time. Our final surge protector is a somewhat intelligent model from Technology Research. Unlike other protectors that simply warn you when something is wrong, this model will indicate the issue on the screen and adapt accordingly. While LED lights are sufficient for most casual users, it’s often better to have a screen to help diagnose the problem. One thing that I don’t like about standard surge protectors is that if they shut down, you don’t always know what went wrong. With this model, however, you can see whether the issue was too much power, too little, or faulty wiring (i.e., reverse polarity). Thus, you can determine if the pedestal is bad or if it was just a small spike. For the most part, if you want high-quality surge protection, you need to invest in a model that comes with at least this many joules. Anything less than that and you could be in trouble. That being said, if you have a smaller rig (like a camper van), then fewer joules should be sufficient since your power needs are not as great. As with the Camco Surge Protector, this model will automatically shut off when the power is too high or too low. With a smart monitoring system, you can sleep easy, knowing that this device will be working at all hours. Overall, this surge protector is almost as close as you can get to an EMS device. I like that it will automatically shut off, and I appreciate the LED screen letting me know what’s wrong. If you’re looking for a simple plug and play model, this is one of the best. Although this unit is better than most, you’re paying for the extra protection. Also, it’s not impervious to its own issues (i.e., manufacturing defects). Also, it may give erroneous error messages from time to time, so be aware of that. I’ve been talking a lot about the various pros and cons of RV surge protectors, so you should probably already know which model I’ll be highlighting here. I like the features and high-tech design of the Progressive Industries Portable RV Surge Protector, and I believe that it will serve you (and your RV) well. With a large LED screen to tell you what’s wrong, an adaptive system that adjusts power based on the output, and a system that will protect your RV in a variety of situations, this is my top pick for best RV surge protector. If you’re more budget-conscious, then the Progressive Industries 313 is a notable alternative. Since it’s made by the same company, you know that the quality is already there. Although it’s not quite as comprehensive as the Portable model, it’s more than enough for most RVers.